It set the summer on fire five decades back. The single was edited down to under three minutes, but the disk jockeys played the original seven-minute album track anyway, from the Doors' eponymous album The Doors. And within a few years it was established as one of those iconic long-form works - "Bohemian Rhapsody", "Stairway To Heaven", "A Day In The Life", "Like A Rolling Stone", etc - that are regarded as the acme of rock. The crude formula seems to be: Length + psychedelic lyric = art. "Light My Fire" comes in at big hit sound 35 on Rolling Stone's Top 500 Songs of all time, and places similarly on other lists of all-time blockbusters. But "Light My Fire" can't be confined to the long-form psychedelia category. For one thing, unlike "Bohemian Rhapsody", it's one of the most "covered" songs of the last 50 years. Once upon a time, that was the natural expectation of a hit tune: it would have seemed extraordinarily reductive to say, okay, some guy's already sung "It Had To Be You" or "The Way You Look Tonight", we better find something else to do. Yet, in an age of singer-songwriters, the idea of a song being particular to one artist became an iron law and deviations therefrom were regarded as "covers", the very term indicating something less than an authentic experience. 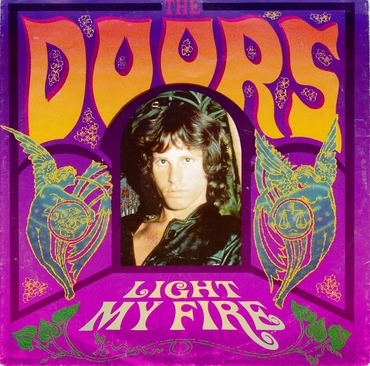 "Light My Fire" must rank as one of the most covered covers of the rock era, and oddly enough it was taken up by the same kind of singers who, a decade earlier, would have been singing standards: the easy listening crowd, the MOR set, the Europop VIP loungers. Who does "Light My Fire"? Everybody. José Feliciano. Astrud Gilberto. Jack Jones. Les Brown and his Band of Renown. Trini Lopez, Nancy Sinatra, Al Green, Minnie Riperton, Helmut Zacharias, Etta James, Woody Herman, Mae West, Johnny Mathis, Charo, Horst Jankowski, Edmundo Ros and his Orchestra, Ted Heath and his Orchestra, the Enoch Light Singers, the Burbank Philharmonic... As Mitteleuropean groovers like to say, "Gekommen auf Baby, mein Feuer beleuchten!" The easy listening guys don't have a monopoly on "Light My Fire" - Amii Stewart did a disco version and UB40 had a hit in their distinctive West Midlands semi-ska style. But, granted the enduring cult around the late Jim Morrison, there's something about "Light My Fire" that seems to appeal to millions of people who've never heard of the guy and have zero interest in the counter-culture. And why not? After all, the song owes its creation in part to Rodgers and Hammerstein. "We talked a while," said Manzarek, "before we decided to get a group together and make a million dollars." Two isn't really enough for a group, unless you're Wham!, in which case it's too many. But fortunately Ray was into meditation and in his class were two other fellows, John Densmore and Robby Krieger. So they had the manpower, they had the name, they were ready to go. Jim told everyone to go home and try writing a new song. The following day, Robby Krieger strolled in and announced he'd come up with one. "Way to go, man!" said Jim Morrison. "What's it called?" John Densmore, the band's drummer, thought it sounded like a Sonny and Cher song, or something for the Mamas and Papas. Fey and folky. Not a trace of William Blake. And you can see how Densmore might get that idea, if all you heard was the verse and chorus. It sounds kind of generically folk-rocky - the redundancy of being a liar after being untrue followed by a generalized assertion of highness. But, on the other hand, everyone thought it was a very cool title: "Light My Fire". "What are the chords, man?" asked Manzarek. And Krieger started to show him - A minor to F-sharp minor. "Whoa, that's hip," said Manzarek, impressed. Up to a point. "But it needs work." It's no "Moonlight Drive", but it takes it out of Sonny and Cher/Mamas and Papas territory and pushes it closer to "Riders On The Storm" turf. "The time to hesitate is through": Seize the moment! Very Sixties. What's the worst that can happen? "Our love become a funeral pyre." Heavy, man! But who cares about the reason with such great rhyme? That's what I love about the lyric. In an age of sloppy "time/mine" false rhymes, "Light My Fire" is almost like a rhyming exercise. There are only two rhymes in the song - "fire" rhymes and "you" rhymes, or two-and-a-half if you include the internal rhyme of "light my fire" with "night on fire". But Krieger's rhymes - "liar/higher" - are conventional pop fare, whereas Morrison's verse sounds like the rhyming dictionary is being stretched to its limits - "mire" and "pyre", but he refuses to tire or preach to the choir. And, if we're a long way from William Blake, you're surprised he didn't get to Lewis Carroll: "'Twas brillig, and the slithy toves/Did gyre and gimble in the wabe..." Indeed, the one impure-ish rhyme - "through/lose" - is rather Carrollesque in the way it carries over the "s" to the "and..." of the next line. The overall result is a weird combination of free love in a constrained form. But it wasn't just Rodgers and Coltrane Manzarek nodded to: Everyone in the band understood that a number like this couldn't just open with your standard pop intro, so he rummaged around for a moment and pulled out a bit of cod-Bach - those circling fifths on the front of the song that tell you this isn't Sonny and Cher, this is Art, with a capital A and a gatefold sleeve. It was the whoa-that's-hip harmonics that sold it to the MOR crowd. If you're an arranger or an orchestrator, there's not a lot you can do with most rock songs: they're harmonically very limited. But "Light My Fire" was born as a kind of medley of possibilities - jazz, rock, Latin, pseudo-baroque, all on one track - and in the late Sixties easy-listening arrangers loved playing around with it. The Doors let the song down in just one respect, I think. Krieger's verse didn't need just a second verse, but a third and a fourth. It sort of hints at some primal power - the elements, man: earth ("mire"), wind ("higher") and fire ("pyre"). But it needs still more elements - maybe undergrowth ("briar"), rubber ("tire"), onion rings ("fryer") or a Tolkien allusion ("shire"). If you hear it without the five-minute Coltranesque solos, the problem with the song is that you run out of lyric. That's why, in the hugely successful Jose Feliciano version, the poor guy's reduced to going "LightMyFireLightMyFireLightMyFireLightMyFireLightMyFireLightMyFire", which sounds like a 911 call for an emergency third verse that never comes. Yet the Feliciano version was such a hit that it became the cover version which half the other cover versions are covering. When Will Young, the first winner of Britain's "Pop Idol", got to Number One with "Light My Fire" in 2002, he was in effect remaking not the Doors' version of the song but Jose's. And the whole "LightMyFireLightMyFire" groove became such a ubiquitous bit of filler that even Sinatra, who never recorded the song, nevertheless liked to evoke the Feliciano shtick: For the last quarter-century of his career, whenever he did Don Costa's jumpin' arrangement of Stevie Wonder's "You Are The Sunshine Of My Life" in concert, he used to wrap up the song by growling "LightMyFireLightMyFireLightMyFire" - which could, indeed, stand for an entire sub-genre of swingin' rock covers. Sinatra, it's safe to say, intended his Jose Felicitous coda parodically. He loathed "Light My Fire". Driving from Palm Springs to Los Angeles one day, he heard it start on one station, flipped to another, heard it again, flipped to another, heard it a third time, and then pulled the car over, ripped out the radio and crushed it under his foot, leaving it to wallow in the mire while he drove off in a state of great ire. Just because the song needed more lyrics didn't mean everyone was on board with the ones it already had. Invited to perform on "The Ed Sullivan Show", the Doors were instructed to eschew "Girl, we couldn't get much higher" for "Girl, we couldn't get much better", which, unlike "Girl, you're starting to perspire" or "Girl, my pants are in the dryer", doesn't even rhyme. Come the big night, on live TV, Jim Morrison forgot to sing "better" and sang the usual "higher". Ed Sullivan was so furious he refused to shake Morrison's hand: Man, you couldn't get much ruder. The producer said they'd never be booked on the Sullivan show again: Girl, we couldn't get re-hired. But what did they care? Fifty years ago, it was a bizarre freakish one-off of a song that caught the ear of all kinds of folks. The boys were right: "Light My Fire" is a great title. If it takes a psychedelic Summer of Love to give Shirley Bassey a real boa-shaker of a number, so be it. And, long after "Riders Of The Storm" has been forgotten, somewhere in some Mitteleuropean tavern some elderly Continental groover with a Hammond organ will still be cranking out "Gekommen auf Baby, mein Feuer beleuchten!" ~This essay was adapted from Mark's book A Song For The Season. Order your personally autographed copy today, exclusively from the Steyn Store. And don't forget, if you're a Mark Steyn Club member, you get special member pricing on that and over 40 other books, CD and other products at the Steyn Store just by entering your special promo code at checkout. As we always say, membership in the Club isn't for everybody, and it doesn't affect access to Song of the Week and our other regular content, but one thing it does give you is the right to light a fire under Mark's take all over our comments section. So, if you're a Club member and feel strongly that the time to hesitate is through, then feel free to open fire in the comments. For more on The Mark Steyn Club, see here - and look for the first edition of our new Club newsletter, The Clubbable Steyn, complete with a seasonal song feature, in your mailbox in the next few days. First time I ever heard it was 'live'. A local band performed a brilliant cover at an Australia Day concert in a country town many, many years ago. It might have been the first live music I had ever heard. I think all my very favorite songs since then have had a heavy dose of rock organ. No matter how tinny the speaker is, songs like 'Light My Fire' and '20th Century Man' (by the Kinks) just fill a room when that organ takes over. I love Steyn's accurate descriptions of the changes and comparisons, as well as his history lesson. But the song always sounded to me like a bunch of chord-jumps, the type of thing a new guitarist writes when he learns his first bar chords. Compare it to My Cherie Amour, where the changes end up in a different key, but a total smooth ride, each new chord somewhat expected, modulating with sevenths and flat fifths. Ok, that's not what the Doors were trying to achieve; they had their own brute-force attraction, a warm familiarity in the minor chords and the awful cheap organ. Mark is right, though, in that I've heard even multiple orchestral covers -- and they, too, struggle with those silly chord jumps. I guess there's just no accounting for taste. I wouldn't include "A Day In The Life" in your list of rock's "iconic long-form works" -- not because it's not iconic, but because it's not particularly long -- certainly compared to the others you mentioned -- e.g.,"Bohemian" and "Rolling Stone" are about 6:00 each; "Stairway" is about 8:00. Against that, "A Day In The Life", depending on how much of the fadeout you choose to include, clocks in at anywhere from 4:45 (musicologist John Covach, who calls it "among the shortest epic pieces in rock") to 5:13 (YouTube/VEVO, but that continues past the track's end to accommodate a promo video). That last reminds me of the eminent jazz critic Francis Davis's helpful rule: Don't do a song as a bossa nova unless it is a bossa nova. Good advice. They knocked that debut album out in a week on a 4 track machine at Sunset Studios in LA. The success of the album and that single hinged on getting more bottom to the music which was vocal, keyboard and guitar based. So, LA studio bass player Larry Knechtel was called in to provide that which the recordings lacked-- a solid rock and roll foundation-- with his Fender Precision bass. The "Wrecking Crew" of LA studio musicians to the rescue once again. Not one of my favorite Doors songs. I much prefer something like "When the Music's Over" or "The Wasp" if I'm going to listen to the Doors, because if I'm going to listen to psychedelic music then let's have it full strength. However, I have to answer your rather derisive comment about still listening to music written fifty years ago. The unfortunate fact of the matter is, at least in the realm of rock music, there has been very little of any merit produced in probably the last thirty five years, certainly in the last twenty. There has been an act here and there, mostly in the Country influenced genre, like say The Black Crows, but mostly the stuff is terrible. And if your retort is that the music of the 60s and 70s has little merit, well you should give a listen to what is being produced now. You may not care for the Beatles singing "yeah, yeah, yeah", but at least they were singing it. In summary, the reason we're still listening to music written fifty years ago is that there hasn't been a sufficient amount of good rock music produced since I left high school to replace it. Thanks for a fascinating piece on a favourite song of mine. But although it is a favourite, I can never listen to the third line ("If I was to say to you") without a twinge of pain at the grammatical error (it should be "If I were to say to you", as it ought to take the subjunctive). I would guess it is the first song of such prominence in English to make that error, and suggest that it is indicative of the decline in the level of literacy of successful songwriters since the 1960s. A telling pair of songs illustrating the trend is "If I Were a Rich Man" in 1964 and "Rich Girl" by Gwen Stefani in 2004, which includes the line, "If I was a rich girl". So, you're saying "I can't get no satisfaction"? I would guess it is the first song of such prominence in English to make that error, and suggest that it is indicative of the decline in the level of literacy of successful songwriters since the 1960s. I wish I was in the land of cotton.... But that may not count since minstrel-show songs were supposed to get the grammar wrong. Grammar Pedants Unite! That's actually a very interesting point about "If I Were A Rich Man". I wish Stefani had added the requisite Yiddishism, I find myself humming "yidle diddle diddle diddle diddle diddle diddle dum" and "yaba babba babba biddle diddle dum" to her version which, oddly enough, does not endear me to my children. Well, you definitely can't argue with success. I remember the first time I heard the song. It sort of exploded onto the scene. And, I remember thinking it had tapped into, and was kind of riding on the wave of, the whole free love movement with the catchy "light my fire" title and lyric. The sound was the thing that really sold it, in my mind anyway. But, while you can't argue with success, you don't have to bow down to it. For me, it must have been a case of traveling to the beat of a different drum, as I thought the thing, despite being catchy and deserving of a hat tip for the newish sound, was contrived, indeed borderline obnoxious. My reaction was like Frank Sinatra's, although maybe not for the identical reason. For a time there, it seemed you just couldn't escape the dang thing.